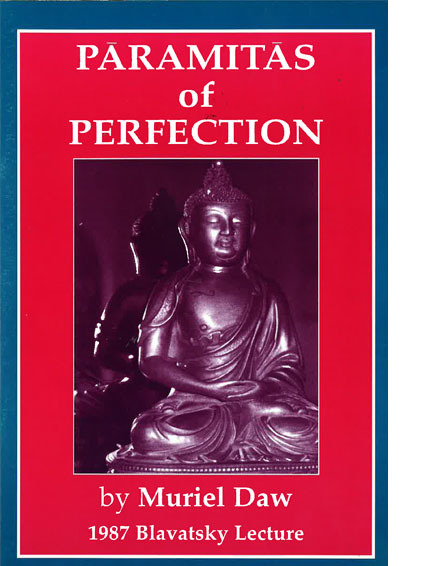 Paramitas of Perfection - Muriel DawHPB’s ‘Voice of the Silence’ refers to 6 & 10 Transcendental Virtues to be explored by the aspirant. HPB tells us that these ideals ‘are not for full-grown yogis … alone, but for all those who would enter the Path.’ Each Virtue has an associated Bhumi or Plane of Consciousness, as well as a symbol. This booklet links the mysticism of theosophy with the Great Path of the Mahayana, and is a useful supplementary study to HPB’s ‘Voice of the Silence’. HPB’s ‘Voice of the Silence’ refers to 6 & 10 Transcendental Virtues to be explored by the aspirant. HPB tells us that these ideals ‘are not for full-grown yogis … alone, but for all those who would enter the Path.’ Each Virtue has an associated Bhumi or Plane of Consciousness, as well as a symbol. This booklet links the mysticism of theosophy with the Great Path of the Mahayana, and is a useful supplementary study to HPB’s ‘Voice of the Silence’.